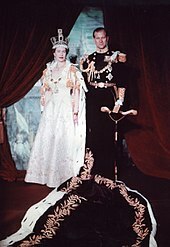 His Royal Highness The Prince Philip, Duke of Edinburgh, Earl of Merioneth, Baron Greenwich, Royal Knight of the Most Noble Order of the Garter, Knight of the Most Ancient and Most Noble Order of the Thistle, Grand Master and First and Principal Knight Grand Cross of the Order of the British Empire, Member of the Order of Merit, Companion of the Order of Australia, Extra Companion of the Queen's Service Order, Royal Chief of the Order of Logohu, Canadian Forces Decoration, Lord of Her Majesty's Most Honourable Privy Council, Privy Councillor of the Queen's Privy Council for Canada, Personal Aide-de-Camp to Her Majesty. ^ Leask, David. Prince Philip beats the record for longest-serving consort. The Scotsman (Edinburgh, UK). 19 April 2009. ^ 1986年英女王首次訪華：爬長城 吃海參 用筷子. 大公報. 2014-06-19. ^ New title for Duke of Edinburgh as he turns 90. BBC News. 10 June 2011 [10 June 2011]. ^ 菲臘親王秋天起全面卸下公職. now新聞. 2017-04-05 [2017-04-05]. ^ 英媒報道 皇夫菲臘親王將於8月2日退休. 星岛日报. 2017-07-26. ^ Lin Jenkins. Prince Philip gives up driving licence three weeks after car crash. 衛報. 9 February 2019 [9 February 2019]. 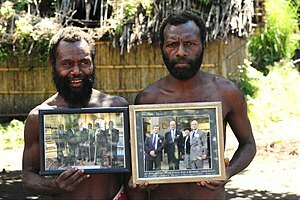 ^ The island that worships Prince Philip is disappointed by his retirement – Royal Central. royalcentral.co.uk. [2018-11-16] （英国英语）. ^ Gill, Peter; Ivanov, Pavel L.; Kimpton, Colin; Piercy, Romelle; Benson, Nicola; Tully, Gillian; Evett, Ian; Hagelberg, Erika; Sullivan, Kevin. Identification of the remains of the Romanov family by DNA analysis. Nature Genetics. February 1994, 6 (2): 130–135. PMID 8162066. doi:10.1038/ng0294-130.